Balancing Jane: Remembering How it Feels to Be "Developmental"
Remembering How it Feels to Be "Developmental"
I love to write, and I have been doing it for as long as I can remember. When I was in elementary school, I used to scribble stories on napkins. When I was in middle school, I kept hundreds of pages of angst-filled journals. In high school, I hid in the back of math class and wrote poems in the margins of my notebook (I still studied for math; don't yell at me, math teachers). Writing has always been something that I just do. Sometimes I get the urge to write and literally cannot sleep until I get up and do it. I've learned not to fight it. But my students don't always feel that way. Some of them do. In fact, I am always blown away by at least one or two students every class who just clearly love writing and have a very clear talent for seeing the world through a creative and unique perspective. They are a joy to teach. But so are the ones who hate writing, and there are a lot of them. See, I teach developmental writing, so my students have often been told (or have told themselves) that they "can't" write. They sometimes hide behind that "can't" to protect themselves from the sting of failure. If they don't believe they can do it, an F on a paper isn't a big deal. More often, though, that "can't" isn't just a shield; it's a block. It stands in the way of everything else they will do in my class. I give them analogies, of course. I tell them that too many people treat writing as a one-shot thing. It's like they decided to try being basketball players without practicing, walked onto a court for the first time, picked up a ball, shot it from half court, missed, and said "Oh, I guess I can't play basketball." We talk about how even the most talented athletes have to practice to get good at their sport. We talk about how the first time they cooked a meal, it probably didn't go so well, but we keep trying until we get it right. I am full of positive metaphors that I really and truly believe. That didn't stop the nagging feeling that I sometimes just didn't get it. Writing is something I love and that--if I'm being honest--comes easily to me. That doesn't mean I don't work at it. That doesn't mean that there aren't times when I want to rip the pages out of my notebook or throw my computer across the room in frustration. It doesn't mean I can't improve. But it does mean that sometimes I forget how frustrating the thing I love can feel to my students. I was reminded of this recently as we were talking about grammar rules. We were going over fragments, run-ons, and comma splices. After going over them, I gave my students an assignment where they had to do some work with them in groups and sat back and listened. As I listened, I was able to understand better. First, I understood that they are trying incredibly hard. I am always so impressed with my students' sincere and dedicated effort. They were debating and testing out new vocabulary ("That's one of those gerund verbs. That means something. I forgot what.") They are working hard. Second, this stuff is confusing. It's not natural or second nature or simple. It is hard and complex and requires a combination of practicing it for themselves and experiencing it in the world around them. Since switching my career to teaching golf is a horrible idea, I decided to approach this a different way. If I am going to teach developmental students, I think it is important that I remember what it is like to be "developmental." And, here's the thing, we're all developmental at something. My students may not be experts at writing (right now), but they are experts in many things. I was reminded of this the other day when I used a building metaphor to talk about the writing process and asked, innocently enough, "What do we have to do first when we build a house?" I was expecting "Put down a foundation," which I was going to connect to having a strong thesis or "Make a blueprint," which I was going to connect to having a solid organizational strategy. Instead, I had a student who clearly had experience in the matter. He talked about the way the ground had to be prepared and that pipes had to be laid and permits had to be approved. The metaphor still worked, but he quickly reminded me of just how much experience and expertise my students truly have--experience that I don't have. "Developmental" education might sometimes be called "remedial" and it might get the reputation of being for students who are "behind," but there are always things we are "developing" and things we've already "developed." In order to make sure that I stay in tune with my students' experiences, that I feel the way that they feel, that I remember what it is like, I have challenged myself to do things that are developmental for me, too. Yesterday, I tried to do pull-ups for the first time. I say "tried" because I mostly failed. I used the assisted pull-up machine at the gym, but I think I still had the weight set too high, and I barely squeaked out three half-way pull ups before I gave up. So I looked up weight lifting moves to strengthen the same muscles and started doing those instead--with tiny weights. When I'm in the weight room working on this, I feel intimidated, exposed, and a little silly. I feel weak and like people are judging me (though they're probably just worried about doing their own thing). I often think about what's going to happen if I can't ever reach my goal. I wonder if maybe I'm not capable of getting strong enough to do it. And that helps me remember, and I think about the things I've told my students about practice and confidence and experience, and I keep trying. 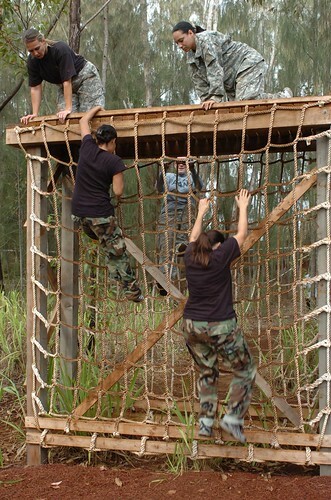 Oh, and I'm signing up for an obstacle course race in October. What are your "developmental" areas? Do you avoid them? Or do you push yourself to get better? Are the feelings of inadequacy and the fear of failing inevitable parts of doing something new, or is there a way to keep them at bay? Math is my developmental area. I think of it the same way you do, there are always things that come naturally to us, and there are things we have to work twice as hard or more to master. I think of it as having intuition for something or not. Despite not knowing the difference between a transitive and intransitive verb, or what a gerund is (I did get a 33% on my English Composition grammar test) I've always been able to turn out papers that get an A, because how to structure writing, and how to formulate sentences that say what I mean, comes as naturally to me as breathing. On the other hand, some the students who's papers I've read that are near incomprehensible have told me they excel in math and science. Clearly they can grasp the structure and meaning of mathematics with a natural ease that I lack. I think more time is needed to learn the things we have difficulties with. If it takes me twice as long to master a math concept as a student who is average at it, then in any semester class that's not simply rehashing what I already know, I'll always come to understand the concept too late to excel on the test or the coursework. I imagine the same goes for some people who struggle with writing. They need more time spent on the concept than is given. The same things that teach people who excell at math are perfectly fine to teach me. I just need to spend more time for my brain to make the same connections they made much quicker. Some colleges will make lower level classes that way, to where they are broken into two halves over a year, but...well my school, as far as I know, has no developmental or lengthened courses. "I just need to spend more time for my brain to make the same connections they made much quicker." I completely agree--and have it presented in different ways. There are lots of ways of saying a thing, and some click better than others. I also hope that I didn't make it sound like I think grammar is what makes writing (I actually don't think grammar rules have much to do with the real work of writing at all, that just happened to be what we were talking about in class recently). Oh no, not at all. You never struck me as a grammar prescriptivist type at all. I understand it has to be taught though, especially in the intro classes (to be honest, I've never seen an English teacher take much joy in teaching grammar). re: the different ways... oh yes, I have seen this. There are the professors who are truly skilled at teaching, who think of all the different ways they can bring learning forth so that they reach every student, it never fails to amaze me how much work some of them put into it. I have seen the difference in say, a biology course where the professor goes out of his way to use media and whacky stories and explain real-life examples from his life versus those professors who stick to what's in the book, and the differences (in the amount of student confusion) are extremely noticeable. It seems like such an obvious realization but I'm really glad I had it in case I wind up teaching one day. It gave me a newfound appreciation for teaching as a subject and field of study in its own right, rather than as simply a natural extension of being knowledgeable in a subject like math or english.